Indoor air quality is one of the most important things that HVAC equipment protects. The Indoor Air Quality Scientific Findings Resource Bank notes that proper ventilation improves speed and accuracy in a work environment. Yet, establishing adequate indoor air quality is complicated, since it is subjective. By using ideal filtration and creating an environment that allows tenants to rely on ventilation systems for heating and cooling, property managers ensure the best indoor air quality for their tenants and customers. HVAC systems are designed to filter out the dust, particles and allergens that come from the outdoors so that they do not compromise indoor air quality. But, the type of air filter used makes a difference in the efficiency of the filtration. While most people are content with lower degrees of filtration, property managers should consider using filters that also remove allergens and other irritants. Each filter has a minimum efficiency reporting value (MERV) rating. The higher the rating, the better the filtration. Using filters with a MERV rating of 9-12 will remove most particles that affect indoor air quality. At A. Borrelli HVAC, we can advise our clients about the best filtration for their unique needs. Making sure that everyone who works in the building is sufficiently warm or cool is a difficult balance to achieve. After all, some people prefer to turn up the temperature, while others want to keep it down. In certain types of commercial arrangements, this tug-of-war can be easily solved by having separate HVAC facilities for each tenant. However, some buildings make this setup unrealistic. Property managers who have several tenants on one system may find that some people throw open the windows or doors, compromising their indoor air quality. But, there is a simple solution, in the form of zoned heating and cooling. With a zoning system, business owners can tailor the temperature to suit their zone, without affecting the comfort of the other zones. So, the customer seating area stays warm, while the server room remains pleasantly cool. Then, tenants rely on the ventilation system for their heating and cooling needs, instead of opening doors and windows. 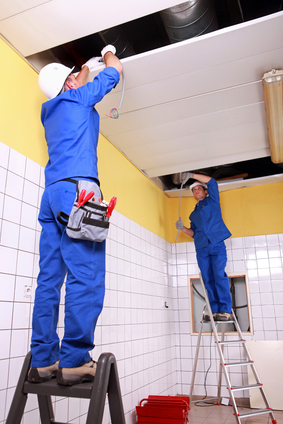 In a commercial environment, property managers can struggle to maintain indoor air quality. But, by ensuring their tenants’ comfort through superior filtration and HVAC systems that allow tenants individual control of temperature, people minimize conflict as well as improve indoor air quality and productivity. If you need advice about your commercial property’s HVAC needs in Westchester County, contact us at A. Borrelli Residential & Commercial HVAC Services.